Until now you’ve used exclusively auto focus point-and-shoot cameras. You’d like to move up to a “real” digital camera with a removable lens and the capability to make manual settings. But maybe you are a little nervous about making this change to a manually focusable digital SLR. Or, you already own a digital SLR but are looking for a second one to use as a knock around camera, a camera to bring with you on a trip when you want to leave your “good” camera at home, for example. The smallest digital SLR on the market. 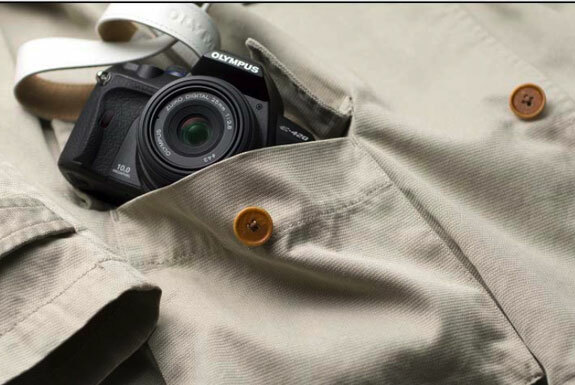 The E420 is not as small as an ultra-compact point-and-shoot; the E420 won’t slip unobtrusively into a shirt pocket. But it will easily fit into a coat pocket or handbag, making the E420 easier to travel with and carry around than any other SLR currently available. An incredibly good deal! Currently around $400 through Amazon (which equals or beats any other price we could find on this camera). And for that price you get a decent 14-42mm wide angle starter lens. People who think they need to $1000+ on a quality SLR camera are wrong. Near-superb photo quality. Look at the 10 megapixel photographs produced by the Evolt E420 and you would never think they could come from a camera this small and inexpensive. The E420 is especially impressive in low light situations (using the noise filter you can shoot quality images at 1600 ISO). It also takes wonderful close-up shots in the macro mode—check out some sample pics taken with the E420, below. Easy to use. In automatic mode, the Evolt E420 behaves very much like a point-and-shoot camera. Even if you’ve never used a digital SLR before you’ll be able to start right into taking photos with the E420 without reading the instruction book. And the same time this camera has . . .
All the manual functions a semi-professional photographer would want. 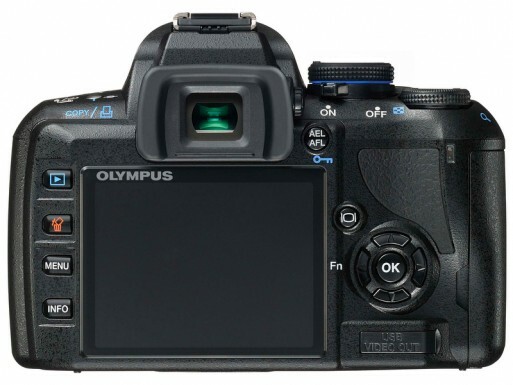 If you are an experienced SLR user you’ll be pleased with the E420′s array of manual settings. In fact, the E420 has a range of manual auto focus, RAW and JPEG settings not available on most much more expensive cameras. This is good news for novice photographers too—as you increase your photography skills you won’t outgrow the E420. Great feel. This is a quality hard to quantify but so important to choosing the right camera—how it feels. There’s something about the E420 that just feels right. It has a solid build and is comfortable to hold. Supremely good value. It is worth stressing this point again. No SLR on the market provides as much photographic quality for the money. As with every camera, there are downsides to choosing the E420. 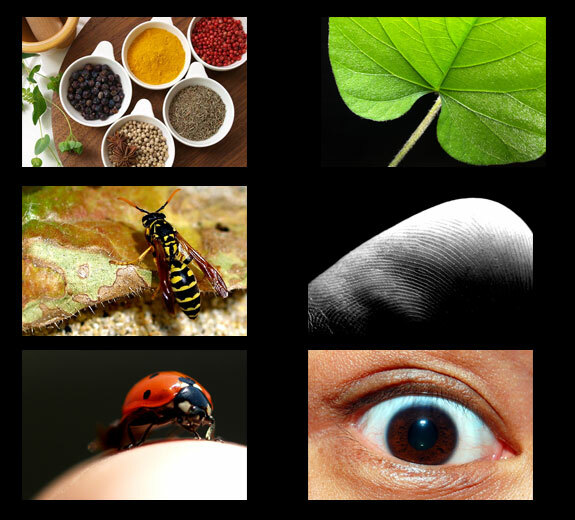 The quality of the photographs is a notch below what you’d get with the Canon 40D or 50D, for example. Of course once you factor in the cost of a reasonable lens you’ll spend more than twice as much on a Canon 40D than you would on a Evolt E420. We also are less-than-impressed with the E420′s flash (though it is still better than most point-and-shoots). We also find the E420′s viewfinder a bit small (though the ability to use the screen’s live view mostly makes up for that). 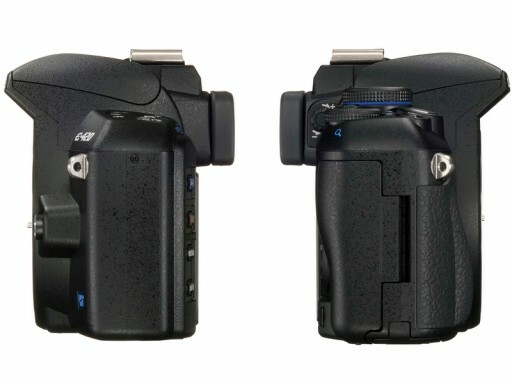 Add up the pros and cons and the Olympus Evolt E420 comes out hugely on the pro side. 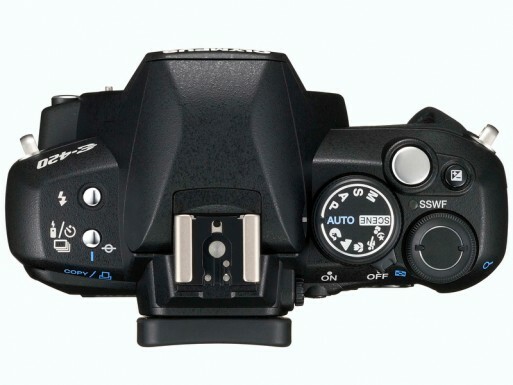 If you are looking for your first digital SLR, buy this one with confidence! NVM! I figured it out, yet im still having the same problems. When in Macro mode, It still will not take the picture. Any other suggestions? CLAIRE: What do i do if i do not have the option to “arrow right” on the AF illumination setting? it simply does not allow me to select that option. For all those mentioning the problem with the flash it is a nifty little flood flash function that fills the areas with sufficient light before taking the shot, but it is a pain when in low light conditions, your best to turn it off and problem solved, to do this you need to press menu, arrow down to the spanner 1 symbol then arrow right, on af/mf arrow right again, on AF illumination arrow right, select off and press ok, press menu twice to exit and it will be on a normal auto flash. Same results for me – difficult to focus and shoot in low light conditions, and the manual does not offer direct solutions. SA- I was having this flash problem also. 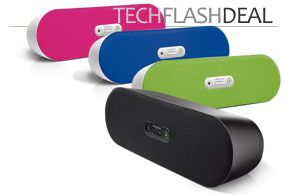 This camera has an RC mode for wireless flash and if it is turned on and you aren’t using a wireless flash system it will give you trouble. The good news is that this is an easy fix. Hit the menu button and go down to the second menu, go over to the RC MODE section and simply turn it to OFF. Hope this helps! SA – I have the exact same problems with my E420 as you are having with the flash and not being able to take pictures in low light. I bought the external flash to help but still fight it at times. I bought my Evolt about a year ago for exactly the same reason you mentioned in the article. It is my first DSLR and I wanted something small and simple. BOY, it’s given me hell. The flash is not automatic even on the “auto” settings. Is there something wrong with it? I’ve tried to look at many forums regarding this issue but no response. Like it will just keep flashing numerous times and sometimes refuses to take the picture, especially in low lighting. I’ve tried the different settings including the “night” settings and the flash is still crazy. The macro shots don’t even want to come out, the camera will just not shoot I will hold the button down and it still won’t. Please help! Wish we could help. We’ve never heard of such issues before–Olympus cameras in general, and the Evolt in specific, is generally a very reliable camera. It sounds like maybe you got a dud. Our only suggestion is to take it to an Olympus dealer or camera repair shop and see what they say. Typically, though, for a camera as inexpensive as the Evolt it costs less to get a new one than replace an old one. I just bought one tonight,it will be my first DSLR and I’m very excited .This article helped me make the decision to buy the Olympus E420 as well as many other reviews. 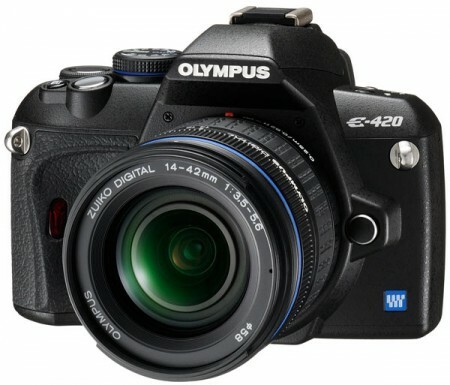 I also tested it out in the store before buying one online.It was easy to use and I am familiar with Olympus cameras so that made it better.I did not want a heavy DSLR and the E420 is perfect for me! Thankyou for the recommendation! Ease of use is a major consideration when considering purchasing a camera like this for someone as a gift – especially for someone who is only just getting into photography. For those who are serious about their hobby, this sounds like a good deal for a present, whether it be for a birthday, Christmas or other event. I’ve had my Evolt for a week now, after reading of it here, and so far just love it! You mentioned in your review how small it was. I think you failed to mention it was so light also.